Nobody welcomed us first of all. The most important mistake is that you can smoke in the whole hotel and we are non smokers. We had been waken up during night cos of horrible smell. There is only one small lift so if you are disabled you will find it difficult. The manager was rude, talking to me and smoking at the same time. Food is ok. Our sheets were never changed and when the staff left our room after cleaning we had to open the window since we could smell her sweat. It was not worth it 370 pp and we booked in December. 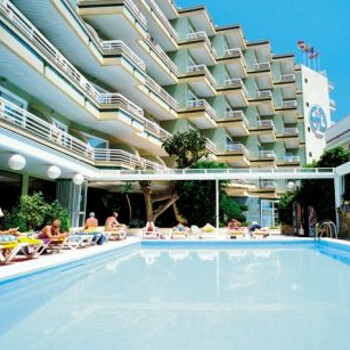 Make sure if you are under 40 and you want to have fun Magaluf is better choice. Stayed at AB on half board basis, food was passable but our biggest gripe was the fact you had to queue at every mealtime, because we did not go on holiday to spend our time in queues we decided to eat out most times, so ended up paying a lot more than we anticipated. The swimming pool is a bit of a joke, when the sun did shine it could only hold about a dozen people in the sun, the rest was in the shade! As far as our room was concerned we were in room 1101, a lovely big room right at the end of the "new block", we were entertained every night by tribute bands from the pub opposite around 11.30 - 12.00, we actually enjoyed this, we used to sit on our balcony watching and listening we had a great view! As far as cleanliness of our room - no problem, and as for the staff (apart from First Choice Rep) all very helpful. Me and my girlfriend arrived at the Agua Beach at around mid afternoon to be met with rude and grumpy men at the reception desk. When we arrived at the room, we were in a state of shock. The room was tiny, it had a small bathroom, a tv with one english speaking channel, the view out the window was of a wall which must have been cut into to build the hotel. There were lamp shades hanging off the wall and the windows didnt lock!. We asked to be located elsewhere but were refused claiming there was no more rooms empty! The food was like a school canteen, but worse! It was bland and tasteless we ended up eating out most nights. However, we did book into the hotel's Italian resturaunt, which can only be visited twice during your stay, the food at the Italian is very nice. The bar area was a nice place to sit and have a drink or two, shame the entertainment wasn't much kop. This was one of the worst hotels I,ve ever stayed in. The food was awful we ended up eating out every day the rooms were dirty and the bathroom was the worst dirty and full of rust. The beds were torn and there were cobwebs hanging of the curtains this hotel is one I will never go back to we stayed two weeks and the pool wasnt cleaned once. We spent as little time as possible in this hotel. We stayed in the Agua beach for a week and thought it was ok and the food was very good with plenty of choice. What lets the hotel down id their tiny lift!!! I could not get my wheelchair into it without having to get out and fold it up and then squeeze into the lift, get to the floor I needed and then get out, unfold chair and get back in. This I had to do several times a day every day and became the whole let down of our holiday. Anyone wheelchair bound would have no chance of getting in it. We had a sea view room which was lovely with a balcony. Air con which wasnt that good and no fride in the room or a kettle. You can hire a fridge for 50 euros which i thought a rip off. Palma Nova was a lovely resort with plenty of shops etc and evening market stalls. Lovely flat promenade to walk along suitable for wheelchairs and pushchairs. Its quieter than magaluff although it does have 2 nightclubs but they do not get rowdy. Magaluff is a 20 min walk away and didnt appeal to us.The beach is gorgeous and clean, sea is lovely and clear but its 9 euros to hire 2 sunbeds and a brolly for a day. The Germans put their towels on the sunbeds by 7am each day so you dont have a chance of getting one and their isnt that many to begin with. Not good. The Germans will always push in front at meal times as well, what is wrong with these people? We went to marineland and paid extra to sit with the dolphins at dolphin school where you can get them to do some trics and stroke them and have your pic taken next to a dolphin, well worth the money and the show is excellent. I would go back to Palma Nova but not this hotel. We stayed in the Aqua Beach hotel but paid extra for a superior room with a kitchen. We did expect the room to be bigger for the extra money that we paid. We had a double bed, a television, a dressing table and a wardrobe. I thought there would have been a sofa of some discription. We had a kitchen which had no cooking utensils at all and no decent cutlry. The freezer was also broke when we arrived. Our sheets were not changed in the 2 weeks that we were there and the towels only once, although the maid did come in every day. The food was ok but rather boring and bland and we tended to eat out every night. The entertainment was very poor for a couple in there twenties but good for older people. The hotel staff were very helpful in any queries that we had. The hotel location is very nice unless you are in the new side of the hotel which is where the superior rooms are located. Alot of these rooms are above noisy restaurants and opposite a loud bar. We will not be returning to this hotel. We were hoping for a seaview as the brochure mentioned most rooms had one, however ours overlooked a Chinese restaurant & kareoke bar and was above a Spar shop! The food was ok I wouldn't have said 3 star though & if you're vegetarian you'll struggle to find anything other than salad to eat most nights. There is a large selection of desserts though so if yiu have a sweet tooth you'll be ok. The location of the hotel is excellent, right across the road from the beach and a short walk to shops, bars and restaurants. It's also not too far a walk from Magaulf so if you want to experience the brilliant nightlife there you can without having to get a taxi. The hotel staff could all do with personality transplants as there wasn't one who smiled or had a cheerful word to say all week. The rep wasn't much help either, she didn't seem to know anything about the hotel and she told us there was a courtesy room available on our last day which there wasn't so we had to wait around all day without a shower until our pick-up at 1.40am! We stayed for 1 week on a half board basis. Our paty consisted of my husband myself and 2 sons 18 and 21. We arrived in the middle of the night to a grumpy reception, the stair carpet loked as though it had not been cleaned for months. Our room was quite nice, large and clean with partial sea view,and overlooking a tatty concrete area. Our sons room was very small with no balcony and looking out onto a wall,the toilet was broken and the TV had no picture, they were very upset and insisted that it was the cleaners room! We complained to the rep at the difference in quality between the two rooms but nothing was done. Food was okay nothing to get excited about but hot and edible, not much choice. The hotel staff were very pleasent and efficent, appart from reception which was manned by a sullen group of guys. The hotel was across the road from a very nice beach, watch out for melon seller my son was asked to pay 6e for a slice! Daytime entertainment was non existent, night time not much better.This was not a problem for us because Magaluf with a lively atmosphere was aprox 20 minutes away, for the young at heart try BCM pay to enter then free all night, my boys loved the foam party. We had a good time but would not return,hotel too shabby. We will return to Majorca as the island and people are very nice. After a fantastic Mediterranean cruise, we arrived at 12pm and had to queue for over an hour to get into our family room. We had requested a quiet, high floor room with a sea view so imagine our surprise when we were given one on the first floor, above a Spar, on a busy road, overlooking a Kareoke bar! It was, however, newly furnished and decorated but filthy. We had to clean the bathroom from top to bottom before use and the bedroom floor was always sandy. The bath would never drain away and on arrival the balcony door was broken. The cleaner only took 2 or 3 minutes to clean the room and used a smelly mop. The Reception staff were grumpy and the Rep useless, more interested in selling us tickets to 'Pirates' than transfering us elsewhere. Food was pure 'school dinner cuisine', lots of fried offerings with very little fresh food. There were not enough staff in the dining room to clear tables and it always smelt of gravy. After a few days we couldn't stomach any more and chose to eat out. The pool was tiny and no good for children as there was no shallow end. The entertainment was simple, Kareoke and a singer in the outdoor area, which was actually quite plesant. The location was great however, right next to the beach and handy for shops, bars etc. Our experience of AB was ok. The location of the hotel is excellent and seemed to make up for most of the negative points about AB. The staff were friendly, especailly the restaurant staff. The bedrooms have satellite tv which have very limited channels. The beds were very uncomfortable. The maids did chage the towels daily but never changed bedlinen. We never actually stayed in for any entertainment so couldn't really comment on what took place. The food was very basic and we often ended up eating out. The desserts were much better than the main meals.